The flavors of the classic French sandwich make an excellent pizza. 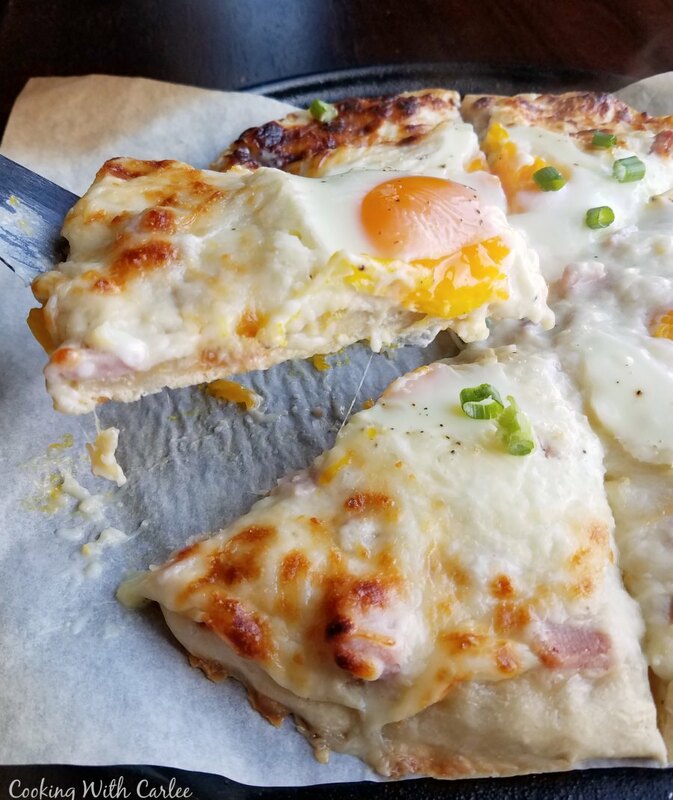 Croque madame has never been so fun to eat! All of this brunch week talk has really made my mind swirl with possibilities. We are a family of egg eaters. I almost never go to the grocery store without picking some up. We also buy a couple dozen fresh eggs at a time from my cousin. Add to that a delivery of eggs every so often from my father-in-law and we are always well stocked. Not a single one goes to waste. Little Dude still loves his "eggs in a pan" which is his code for scrambled eggs with cheese. We boil eggs a dozen at a time. My husband eats one almost every day and Little Dude enjoys making his avocado egg salad. But brunch week and Mother's day have me thinking more about egg-spanding our egg repertoire. 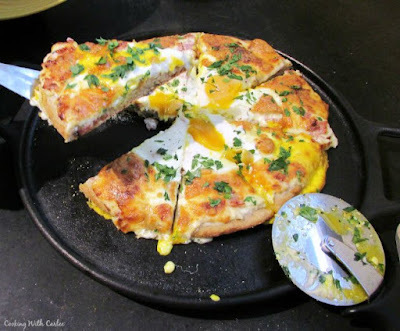 I have been wanting to do croque madame for you for a while now. For those of you who don't know what that is, it's basically a ham sandwich with a creamy bechamel and cheese all baked until gooey and topped with an egg. Talk about a great brunch food! But I wanted to change it up a bit, so I made it in pizza form instead. You can buy pizza dough at a lot of grocery stores, but you can make it easily too. I have been using this whole wheat recipe for a while now and we love it. But recently I have been really into sourdough, so I made a whole wheat sourdough crust for this pizza. It was delicious!! I will share more about my sourdough baby one of these days, but I still have a lot to learn. The other secret to my pizza is the pan that I used. You can certainly use a pizza stone. I love mine! But I bought a cast iron version last year and it is my new favorite. We grilled pizza over a wood fire a few times last year and I love using it in the oven too. Having a really hot pan is the key to getting the nice crisp crunch on the very bottom of your crust while not turning it into a cracker. It is the key to making a pizza that can hold up to all of these delicious toppings. This pizza is going to become a regular at our house! It would make a fun brunch type dish, a perfect lunch or a great dinner with a salad. I hope you give it a try! Preheat your oven and pizza stone (or my favorite cast iron pizza pan) to 475 F at least a half hour before you plan to bake the pizza. Roll pat or stretch your pizza dough into a 10-12" circle, set aside for its final proof. In a small saucepan or skillet, melt the butter over medium-low heat. Whisk in the flour and cook for a couple of minutes. You don't want to brown, just enough to cook off the flour flavor. Whisk in the milk a little at a time to ensure you don't have lumps. Once all of the milk is added, continue to cook and stir until the bechamel is thick enough to coat the back of a spoon. Remove from heat and stir in Dijon mustard. Season with salt and pepper. 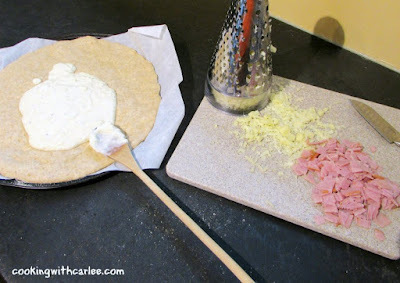 Gently spread bechamel over your pizza dough. Sprinkle with ham and cheese. Move pizza to hot pizza pan and bake at 475 F for 10 minutes. 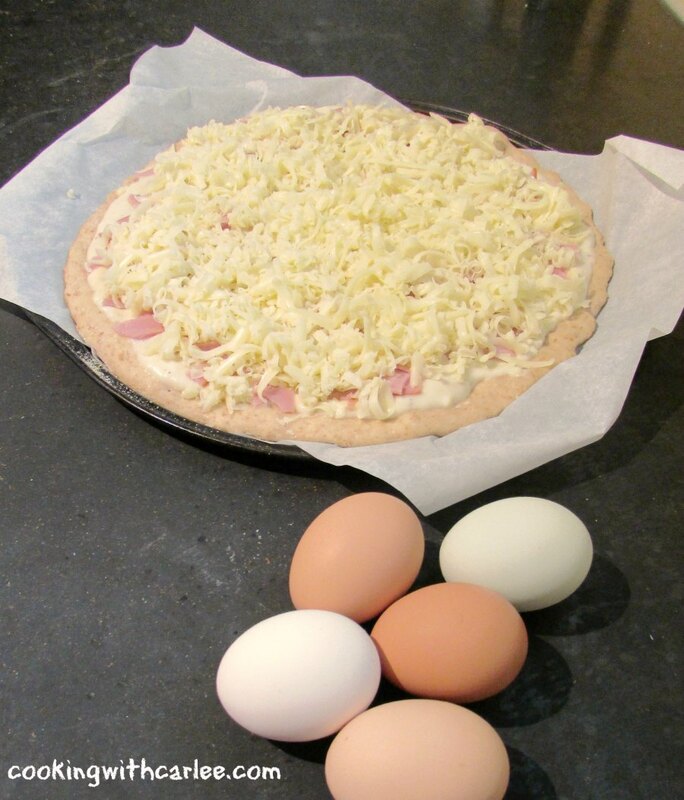 Quickly break eggs onto pizza and return to oven for another 5 minutes or until eggs are cooked to your liking. Oh does this ever look yummy! You know I love a good brunch and I always love to serve something unique that you don't see all of them, this recipe is perfect! I love to cook with cast-iron but I don't do it nearly enough. Can't wait to make this and tell everyone it was created by Carlee!! I have really been into cast iron cooking lately. I love how versatile it is! I hope you love it if you make it, Andrea! I have never heard of a croque madame but it looks delicious. I will have to try it now. Thanks for the recipe! They are a deliciously decadent way to have a ham sandwich... or a really good pizza! Me too! I actually have another batch of pizza dough proofing now for chicken parmesan pizza tonight. We are on a pizza kick! Don't you just love fresh eggs? Thank you! What an awesome idea! I love Croque Madame's and I never would've thought to make it pizza. It makes for a great pizza! Thank you! Delicious looking recipe. We eat a lot of eggs also in our family. Very creative! Thank you! Eggs are so versatile, but I am still surprised how quickly we go through them! Thank you for sharing this delicious recipe at the #RecipeSharingParty! I hope to see you next week. Pinned and Yummed. Please visit #OverTheMoon on Sunday or #ThursdayFavoriteThings for more sharing fun! Don't forget to Comment your link #'s so I can be sure to visit and you get a chance to be featured! Happy Mother’s Day! It is hard to stop, so that is a great idea! Thank you! Thanks Mollie! It was a great brinner and would be a fun breakfast too! This is a great breakfast pizza, it looks awesome! Thanks so much for sharing them with us at Full Plate Thursday and come back soon! Thank you, it really was good! Carlee, my husband would love this! Thanks so much for sharing at You Link It, We Make It! I'm pinning for dinner soon, I'm betting my kiddos would love this too! I hope you all enjoy it! I have a feeling it is going to be a part of the regular roation around here for a while! 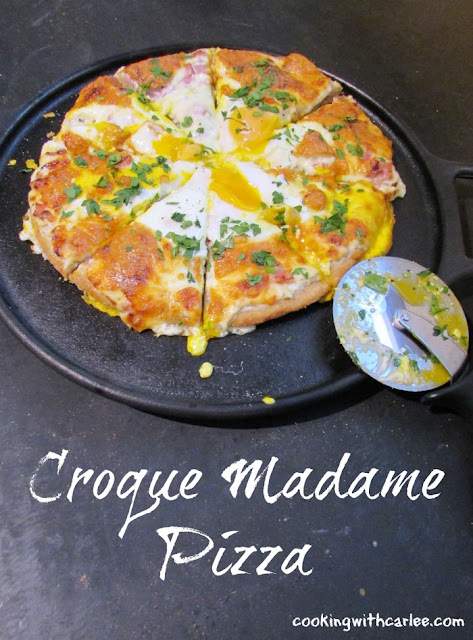 Croque Madames are a favorite of mine - it sounds even better as a pizza! Thanks for linking up with Merry Monday this week! It really is wonderful! Thank you!